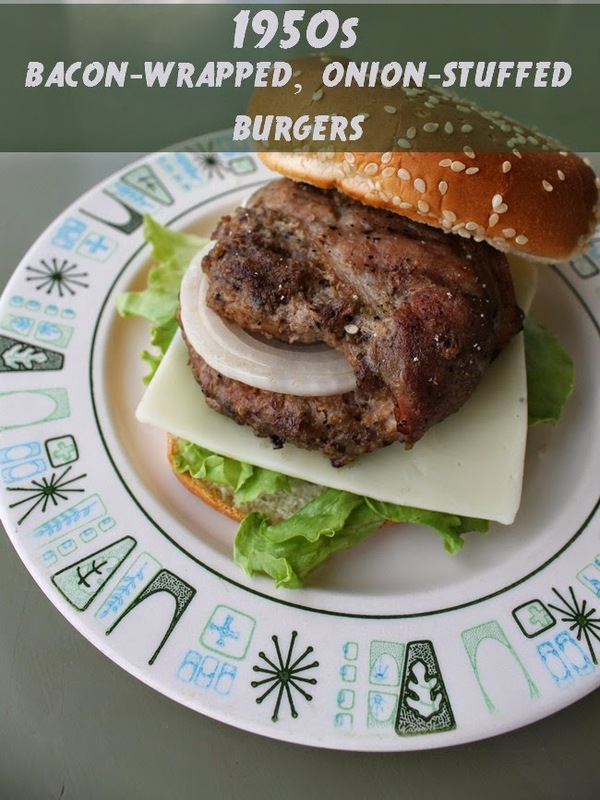 With the 4th of July celebrations this weekend, I wanted to share a classic 1950s burger recipe from one of my vintage magazines. This one was called "Hamburger Specials", which is a burger pattie stuffed with onion, wrapped in bacon and topped in melty cheese. mix beef, eggs, bread crumbs and wor. sauce in an adorable vintage pyrex bowl. separate the mixture into 16 meatballs. To do this, I split it into 2, split those 2 into 2 and so on. form 16 patties. set an onion slice in the middle of 8 patties. wrap each burger in a slice of bacon because everything in the 50s was wrapped in bacon. you can grill or bake these little babies. To bake, set the oven to 375 and bake in another adorable pyrex baking dish for about 30 minutes. The burger will sizzle in the bacon grease as it cooks and its so goooood!! I read in one of my housewife books that if you put a slice of bacon under your meatloaf, it won't stick to the pan and that also works with these burgers! If you grill the burgers, keep a close eye and a beer on hand because that bacon likes to try to catch on fire! Ours got a little crispy on one side so I think we'll stick to the oven method. If you have extra bacon left over, you can bake it in the oven on a cookie sheet with the burgers for 15 minutes or till it's done to your liking. Serve it for burger/fry topping or save for bacon bits in your potato salad. top with cheese, lettuce and whatever other fixin's you like and enjoy! Yum, yum, super yum!!! This looks so fabulously tasty and instantly takes me back to days spent enjoying summer BBQ's at my paternal grandparents house when I was growing up, as my grandma sometimes stuffed her burgers with onions (a lot of her recipes were straight up 50s/60s/70s, which was awesome! ), too. I'll have to do that the next time I make them myself. Thanks for the tasty reminder!